Feeling pressure from other states rushing to the beginning of the primary calendar, Iowa Democrats voted to move their leadoff precinct caucuses to Jan. 3. Republicans picked the same date earlier this month. The Democrats' move Sunday will let both parties continue the tradition of meeting on the same night. The state's caucuses had been scheduled for Jan. 14. The move, confirmed by party spokesman Chris Allen, means the major remaining question about the calendar is the New Hampshire primary, originally scheduled for Jan. 22. 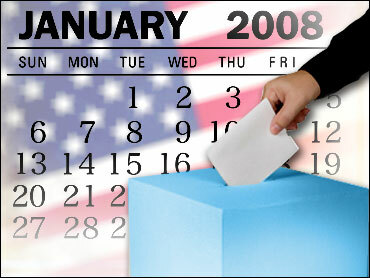 New Hampshire Secretary of State Bill Gardner has said only that he would schedule that primary no later than Jan. 8. Both Gov. Chet Culver and Sen. Tom Harkin, Iowa's top two Democrats, had pushed for the Jan. 3 date, and Iowa Democratic chairman Scott Brennan last week made that recommendation to the party's state Central Committee, which approved it. But former GOP House Speaker Newt Gingrich said the decision by Iowa and some other states to move their caucuses or primaries up in the campaign calendar was not good for the presidential nomination process. "This whole presidential process is terrible for the country. You have much too early a decision cycle, you have everything jammed together," Gingrich said on NBC's "Today" show. "It gradually exhausts the candidates and overly focuses them on raising money." The decision was the latest development in a historically early White House competition that has defied precedent in terms of jockeying for position, campaign debates, large campaign expenditures, broadcast advertisements and hundreds of candidate appearances. The scheduling decision was eagerly awaited by the various presidential campaigns, which have been building huge organizational operations in the state as well as spending heavily on advertising. Mark Daley, a spokesman for Hillary Rodham Clinton's Iowa campaign, said campaign strategists build a detailed timetable. Daley said most campaigns were less worried about the precise date than having one selected so planning could begin. For decades, Iowa's precinct caucuses have marked the first major test of strength in the presidential nominating season, followed by New Hampshire, which holds the nation's first primary election. In this cycle, however, other states have sought to get a piece of the action  even to the point of running afoul of their party establishments. They want the attention and increased influence that early balloting brings and feel they can do this by moving up in the campaign calendar.